New! Order the "Self-Extracting File Format" option to get this product in an editable Microsoft Word document! 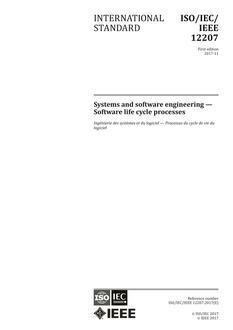 The last phase of the software engineering lifecycle, operation and maintenance, often takes the majority of life cycle funds. Proper planning can help reduce life cycle costs for this phase. It is therefore prudent to possess software maintenance plans and procedures to contain life cycle costs, and to operate an efficient organization. It is important that an organization have an excellent software maintenance plan. A software maintenance plan template can provide help for an organization and a software engineer, who may not have extensive knowledge of software maintenance to implement this process. The template was developed by an international authority in software maintenance that possesses years of hands-on, practical experience in maintenance. The plan template is neither theory nor an academic exercise. The author provides maintenance plan wording and recommendations based on his experience in planning for and the actual maintenance of software systems. The plan template incorporates the latest commercial standards for software maintenance. It provides a detailed maintenance process. No expensive training or extensive experience is necessary to use this Template. This templates' illustrative text is designed for use as is, by stripping the tutorial notations underlined in the text. The text can also be modified for requirements and guidance to meet organizational needs, and unique environments. It is not a requirement to use the paragraph numbers contained in this document and additional comments are encouraged whenever appropriate to fully comply with organizations' specific requirements. The user of this template should spell out all of the issues that are prevailing regarding the need for software maintenance prior to tailoring the template to ascertain that all such organizational issues are addressed. This template is applicable to all types of software from information technology, commercial, scientific, and other non-business applications (such as creating a complex web site). Every Template comes with three hours of free consultation. SEPT will answer any question concerning the template for 60 days after purchase. Order this great software maintenance tool today!